DIY floating LED light water fountain with super bright LED ring light, Jebao pump, easy plug & play. 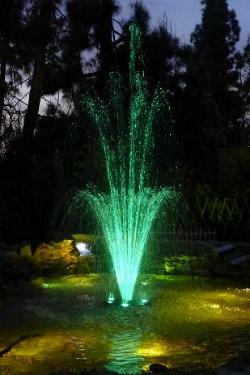 Great floating fountain for pond, lake & water garden. 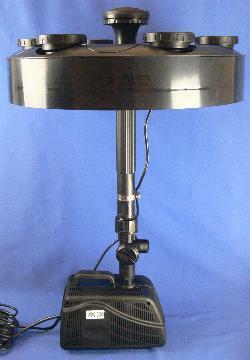 Prices include ground shipping and handling fees for shipping address within the 48 mainland United States. 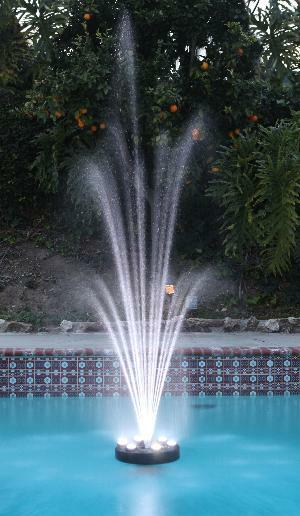 Fountain in the picture, water shooting is 9' tall, about 7' wide in a 3 tier shape. Using two different nozzle kits, you can get a trumpet water fountain or a traditional three tier water fountain. 1. MC480 is a perfect LED ring light with detachable floater, its submersible LED light is detachable and replaceable, completely waterproof, 6 or 12 lights are pre-installed for easy setting up, available in color changing or all white. 2. 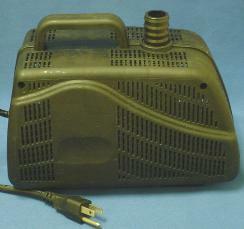 A Jebao pump WPG2000. 3. Two nozzle kits, one makes trumpet water fountain, one makes three tier water fountain. Package 1. 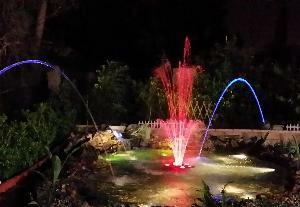 Item PJ2000-6C; Ocean Mist ® Magic Pond floating water fountain with 6 color changing LED ring light. Including a MC480-6C floating ring with pre-installed 6 color changing LED light 33' cord, a Jebao WPG2000 water pump 33' cord, a trumpet and a 3 tier nozzle kit, easy plug & play. Water shooting is about 8' tall, 6' wide in a trumpet shape, and about 9' tall, 7' wide in a 3 tier shape with color changing automatically. Package 2. 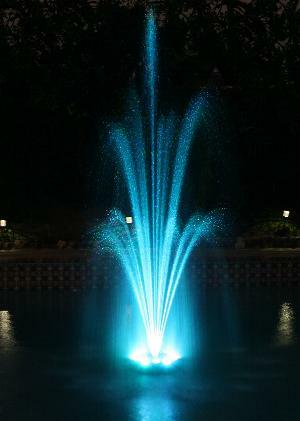 Item PJ2000-6W; Ocean Mist ® Magic Pond floating water fountain with 6 all white LED ring light. Including a MC480-6W floating ring with pre-installed 6 white LED light 33' cord, a Jebao WPG2000 water pump 33' cord, a trumpet and a 3 tier nozzle kit, easy plug & play. 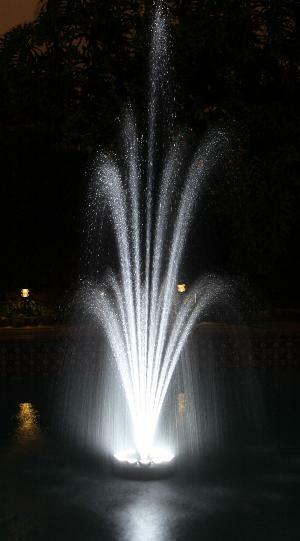 Water shooting is about 8' tall, 6' wide in a trumpet shape, and about 9' tall, 7' wide in a 3 tier shape with white light. Package 3. 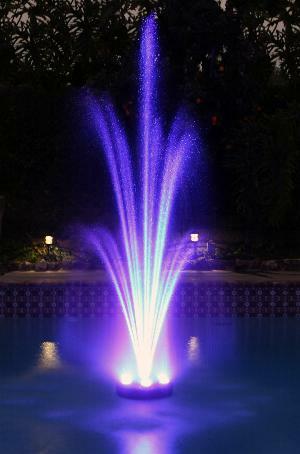 Item PJ2000-12C; Ocean Mist ® Magic Pond floating water fountain with 12 color changing LED ring light. Including a MC480-12C floating ring with pre-installed 12 color changing LED light 33' cord, a Jebao WPG2000 water pump 33' cord, a trumpet and a 3 tier nozzle kit, easy plug & play. Package 4. 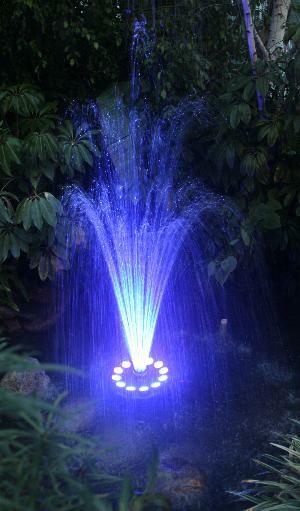 Item PJ2000-12W; Ocean Mist ® Magic Pond floating water fountain with 12 all white LED ring light. Including a MC480-12W floating ring with pre-installed 12 white LED light 33' cord, a Jebao WPG2000 water pump 33' cord, a trumpet and a 3 tier nozzle kit, easy plug & play. 3 tier plastic fountain head with aluminum adaptor for PJ2000 fountains, comparing to PJ2000 its original 3 tier nozzle, this nozzle has bigger spray holes, shooting thicker water lines, but a little bit lower, see picture on the right. Using a 2000GPH pump, its water spray is about 6' high. 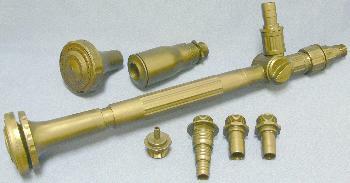 The adaptor is used to connect the nozzle to the PJ2000 water pipe. Simple in installation. Light and pump are not included. 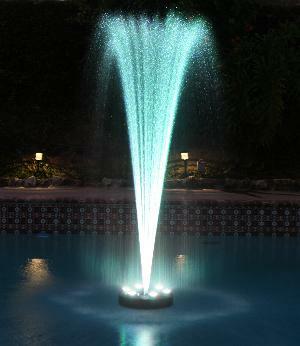 Floating water fountain comes with 48 LED light ring and our WPG1000 pre-filter pump which has Max. output of 1000GPH. 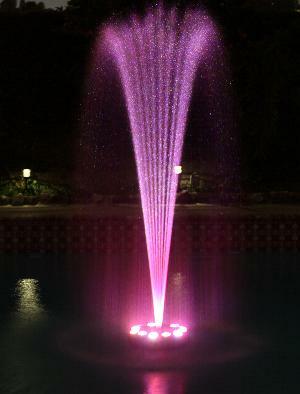 Floating water fountain comes with 96 LED color changing light ring and our WPG1000 pre-filter pump which has Max. output of 1000GPH. 110V/60Hz AC UL approved submersible Jebao water pump in pre-filter box for pond, waterfalls, or water project. Output 1584gph, 190W, head max 15.8 ft, cable length 33 ft. 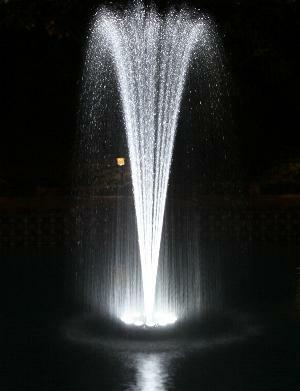 Item number: PJ2000+FT05+C1; LED light water fountain with extendable pipe, valve and pump. 30" fountain pump nozzle kit, it comes with 3 spraying pattern nozzles(3 tier shape, umbrella shape & straight up shape), an extandable pipe(8" range) and flow adjustable valve, pump connector size 3/4", 1" and 1 1/4". 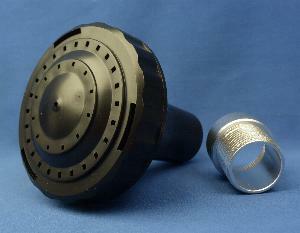 This fountain kit comes with our pump WPG2000 and our LED light ring MC480-6 or MC480-12.